PM II2, p. 28-29 (54). KRI V, 213, 13-214,7 ; KRITA V, p. 180. H. GAUTHIER, Les fêtes du dieu Min, RAPH 2, 1931, p. 268-274 .  S. SCHOTT, « The Feasts of Thebes », dans H.H. Nelson, U.Hölscher (éd. ), Work in Western Thebes 1931-33, OIC 18, 1934, p. 75, fig. 32 . THE EPIGRAPHIC SURVEY, Reliefs and Inscriptions at Karnak - Volume I. Plates 1-78. Ramses III’s Temple within the Great Inclosure of Amon, Part I, OIP 25, 1936, pl. 17 A, 18 . K.C. SEELE, « Some Remarks on the Family of Ramesses III », dans O. Firchow, Ägyptologische Studien, Berlin, 1955, p. 309 . E.F. WENTE, « A letter of Complaint to the Vizier To », JNES 20, 1961, p. 255, n. 14 . W.J. MURNANE, « The “King Ramesses” of the Medinet Habu Procession of Princes », JARCE 9, 1972, p. 126, n. 24 . P. GRANDET, Ramsès III : histoire d’un règne, Paris, 1993, p. 64, n. 74, p. 270-272 . A.J. PEDEN, The Reign of Ramesses IV, Warminster, 1994, p. 2, 7-8 . E. SULLIVAN, « Visualizing the size and movement of the portable festival barks at Karnak temple », BMSAES 19, 2012, p. 30, fig. 45 .